SPB [Strategic Planning Board] viewed the application on 26th Aug 2015 and 10 councillors voted for refusal with 2 abstentions. see Planner’s recommendation. Councillors felt this was the right time to make a decision as “residents deserved an answer” and voiced various concerns; the EA Permit Refusal, their findings that problems with odours could not be mitigated so close to homes, and the possibility of the 60 year old tanks not being gas tight. 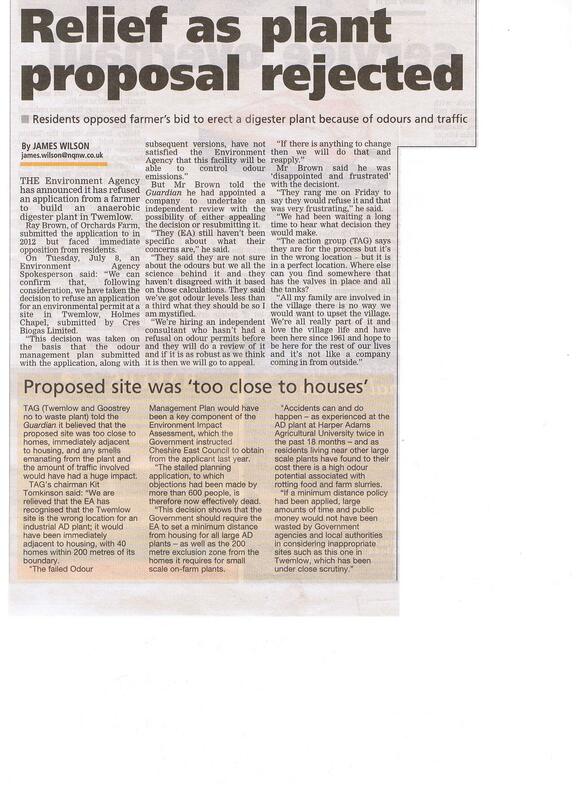 One councillor voiced his experience of AD plants having “hideous smells”. The application was first registered in February 2012 so concerned residents were relieved to finally have a decision after waiting three and a half years. 1. Environment Agency: The EA refused a Permit. 2. Cheshire East Planning: Refused 26th Aug 2015. In May 2013 the Secretary of State concluded “that development would be likely to have significant effects on the environment, because of its nature, size and location” … directing that an EIA Environment Impact Assessment would be required, though one was not produced. TAG are pleased that Twemlow Parish Council and Goostrey Parish Council changed their responses to object. Both parish councils initially supported the application despite two objections by the Environment Agency; they reviewed their stance and objected to the proposal following the EA’s findings. Even if an AD plant is granted an EA permit it does not guarantee that it would’nt smell; existing AD plants that have had problems with odours have had both planning permission and EA permits. What a load of rubbish, the only thing that needs to be stopped is this website. Many people have found this website of interest, with over 22,000 hits, and every effort is taken to ensure accuracy. We have nothing against AD – just the inappropriate location for such proposals so close to homes. I have found this website very helpful, informative and accurate. AD may be the future but as long as they are sited away from homes, as they are in Germany who are leaders in the field. As for rubbish – I don’t want 47,000 tonnes of it being shipped into the small hamlet of Twemlow. Thank you TAG for your good work – keep it up. …..EA’s report to the House of Lords Science and Technology committee Dec 2013.